Wood pellets (wood granules) - alternative non-polluting fuel received from waste products wood industry. Wood pellets (wood granules) share on 2 categories: for use in a private sector and industrial pellets. Fuel granules for use in a private sector differ high quality of raw material of which they are made. maintenance(contents) of a bark in such granules should not exceed 5-7 % from total amount of raw material. Humidity pellets should not exceed 10 %. surface pellets should be firm and brilliant. Wood pellets (wood granules) first-rate quality should be white color. Such pellets use in boilers and fireplaces for heating private(individual) houses, cafe, restaurants, small office buildings etc. Cindery rest of such wood granules does not exceed 0,5 % from volume of combustible fuel which may be used as fertilizer on an adjoining site. Industrial pellets make of raw material more poor quality. maintenance(contents) of a bark in such fuel may reach(achieve) 25 %. Accordingly and cindery rest äîñòî÷íî big - no more than 3-5 %. But for industrial scales it not and is a lot of. 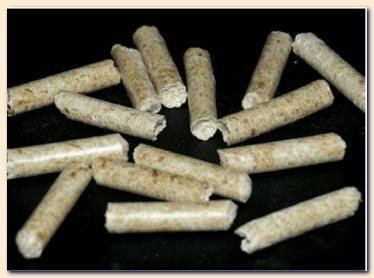 cost such pellets, certainly, is lower and they are used in ïðîìûøëåíûõ boiler installations. For a private sector such fuel is not recommended, since it essentially will increase size of operational expenses. World(global) boom on wood fuel granules not only does not calm down, but also expands with new force. Granules in European houses became habitual fuel, most ecological and cheap in world, " fuel of future " as have nicknamed it(him) all over world. That such Wood pellets (wood granules)? At this product it is a lot of names. From foreign two are distributed: " Wood pellets " and "Holz-Pellets", or "Holzpellets". From Russian: "biogranules", " fuel granules ", "biomass", " îïèëî÷íûå granules ", but most correct name " wood fuel granules ", or is simple "pellets". - " Wood fuel granules " is normalized cylindrical pressed product from dried up, left in To nature of residual wood, such, as a flour(torment) from work of ôðåçåðíî-detachable machine tool, a shaving and rests of wood wood. - Wood granules are made without chemical fixers under a high pressure. - Length of wood granules about 20-50 mm, diameter of 4-10 mm. - Òåïëîòâîðíîñòü wood granules it is equal 5 kw / hour on one kg. - thus ýíåðãîñîäåðæàíèå one kg of wood granules equally ïîëóëèòðó liquid fuel (a fuel sel engine). Wood granules are a standardized kind of fuel, therefore for them there are specifications, as GOST in our country. In Germany specifications (the requirement of quality) refer to as DIN (the German industrial standard). In Europe until recently used German standard DIN 51731 and standard of Austria OENORMM7135. In connection with arrival on market of low-grade wood granules made basically abroad, since spring 2002 of a granule in Germany receive new certificate DIN plus. This certificate has united German and Austrian standards. Advantage has received requirement on èñòèðàíèå, and also rules and a technique of check. main thing, on what western consumers pay attention, are sizes, çîëüíîñòü and èñòèðàíèå. Raw material. as raw Material all coniferous breeds and soft grades of wood should serve. With firm grades there will be problems with equipment. A plenty of a bark is an increase of emission of carbonic acid: she(it) should not exceed in many countries of Europe of 0,5 %. raw material should not be old as it loses elasticity and, main thing, internal energy which gives during combustion. old which has deteriorated in storage, rotten raw material, as a rule, is struck ãðèáêîì and a mould. Humidity. Humidity before pressing should be no more than 10-12 %. At superfluous humidity at you may not buy production or strongly underestimate cost. equipment. Certainly, equipment should answer most rigid norms. At certification of production one of important questions - manufacturer of equipment. good equipment - qualitative granules and high cost. Clearing, storage, transportation. If you have made qualitative wood granules, is yet all. Before packing of them it is necessary to clear of a dust. Further - to store(keep) in a dry place. Further - to transport protected from a moisture. After warehousing to not suppose strong loadings and friction. Qualitative pellets - granules equal, without cracks, brilliant, well pressed, good ýíåðãîîáìåí. Red inserts - codes protecting goods from fakes. Poor-quality pellets - non-uniform, granules with cracks, ðàññûïàåòñÿ, ýíåðãîîáìåí bad. Requirements to quality of wood granules as fuel are showed first of all by manufacturers of furnaces and boilers. In connection with that furnaces and boilers with automatic loading wood granules, biogranules are ultramodern heating units, to quality of fuel rigid requirements too should be showed. If they are not carried out, manufacturer, first, may remove(take off) a guarantee, second, productivity of furnaces and boilers will fall sharply, and charge of fuel to raise. A surface. Surface of granules should be smooth, brilliant not have cracks and swellings. It testifies to their durability and small èñòèðàíèè. Diameter. meets 6 and 8 mm, much less often than 4 or 10 mm More often. Diameter subsequently plays a significant role in adjustment of work of furnace and boiler for effective heating. Greater or smaller diameter specifies, that enterprises were not engaged in manufacture of wood granules, and made others ãðàíóëèðîâàííûå products. Length. Length of granules is limited for systems âñàñûâàíèÿ. Diameter øëàãîâ in Europe does not allow to soak up a granule in length more than 50 mm. But granule should not be infinitesimal on length. A smell. Granules do not smell as a fur-tree. An easy sweetish smell of glue - an attribute of high quality achievable by fluidity and high temperatures at ãðàíóëèðîâàíèè. Color. Color should not be grey it specifies long lying of raw material, occurrence ãðèáêà, bad storage, that for wood is loss of energy. Love granules of light tone though dark colors are not an attribute of bad quality, but poor-quality granules, as a rule, dark color more. A dust. Big maintenance(contents) of a dust may result in claim. It is an attribute fast èñòèðàíèÿ and bad quality. At storage in closed bags of a dust, as a rule, it is less. Wrong tests. it Is wrong to check granules ðàçáàâëåíèåì water. Yes, good granules quickly are not dissolved, but thus also granules made with a plenty of fixers long are not dissolved. Check by a corner of a natural slope (<50 %) also is not an attribute of quality. All these external attributes allow experts to define(determine) quality of raw material and equipment and correctness of technological circuit. However they may not be determining without criteria which are specified in specifications. most reliable and simple way of quality check is check by device (ëèãíîòåñòåðîì) on èñòèðàíèå. As a kind of fuel wood granules (pellets) consider(examine) in Europe as " fuel of future " or as " fuel with confidence in future ". Wood granules are not new raw material. In XIX century heated houses a shaving and sawdust, and for their transportation and warehousing weight condensed. In 1996 wood granules for first time were certificated in Germany as a kind of fuel. Why such interest and boom on biofuel today has appeared? Wood granules as derivatives from wood are renewed raw material. And such fuel as petroleum or gas, with each year will grow in cost and will soon be finished. Wood granules (pellets) have high ýíåðãîêîíöåíòðàöèåé at insignificant borrowed(occupied) volume. Except for it, granules may move in automatic furnaces and boilers, are easily transported and may be blown on a warehouse and transport. Ashes may be used as fertilizer or insignificant dust. Ashes makes only 1,5 % from weight of fuel. Ashes is cleaned(removed) in modern furnaces and boilers alternate years. As granules have high bulk weight, places for warehousing it is required not much. For heating by granules of a house by area 150 sq. m is required only 7,5 cube. M for a stock for one year. For manufacture of wood granules It is required 3 % of expenses of energy. Thus at petroleum these ýíåðãîçàòðàòû make 10 %, and at electric power - 60 %. Due to set forth above Ability to qualities wood granules (pellets) have High competitiveness in comparison with other kinds of fuel. costs on pellets do not depend on jumps of costs for mineral kinds of fuel and on increased ecological taxes. And if to take into account cost it is possible to look with hope in future. That such wood granules pellets, how fuel? it Is resulted(brought) comparative diagram of caloric content (heat of combustion) various types of wood fuel in comparison with wood granules. In mass market four kinds of furnaces are now sold, Working on wood granules. Sometimes boilers on wood granules combine With boilers working on lumpy wood. Capacity of these boilers may reach(achieve) 50 ÌÂò. These boilers are capable to be switched automatically From a mode of loading pellets in a mode of loading Wood. Combinations pellets-gas are applied, pellets- sel engine, pellets-ýëåêòðî etc. When in western editions speak about advantages of wood granules, first of all question is ecology. For today from all power-intensive kinds of fuel most non-polluting is pellets. Certainly, today in Russia we not so reflect on ecology, we recollect it(her) only then when there are accidents. In West on it not only reflect, but also punish, enter ecological taxes. And on contrary, encourage everyone who uses non-polluting energy sources. For example, that family or enterprise in Germany will establish boiler working on fuel granules, state pays grant at a rate of 2500 Euros plus 50 Euros for everyone of 1 kw of boiler (about 3000 Euros). Unless not stimulus? Reduction of a hotbed effect Released(exempted) carbonic acid (CO2) in wood granules is designated as "neutral". Wood releases(exempts) It is so much CO2, how many has accepted during growth (the closed carbon exchange). At combustion of mineral fuel carbonic acid collected for millions of years, on contrary, is released(exempted). And it conducts to increase of maintenance(contents) CO2 in an atmosphere and, hence, to an anthropogenous hotbed effect. Reduction of acid rains Alongside with reduction of emissions óãëåêñèëîòû at use as fuel of wood granules there is a reduction of emission of dioxide (äèîêñèäà) sulfur. And it, in turn, results in reduction of acid rains and decrease(reduction) of destruction of a wood. Using wood as raw material, pellets as fuel finally protects our woods! Reduction of risk of transportation Environmental contamination by such troubles as a passage from holes in bulk-oil tankers, failure on gas mains, power stations, including atomic power station, completely disappear at use pellets. And danger of explosions, failures, a passage of fuel, harmful emissions simply scanty in comparison with mineral kinds of fuel. comparative diagram of emission CO2 (ã/êÂò/hour) in an atmosphere of different heating systems (electric, on an easy sel engine, gas and on wood granules) Below is resulted. And figures are given in view of emission CO2 necessary for reception of fuel. Without comments! As an example: if only one family from three persons, living in separate house, will proceed(pass) from boiler working on sel fuel, on boiler with wood granules, it will release an atmosphere of emissions of 5 tons of carbonic acid per one year, and if with gas - 2,5 tons of harmful emissions.